Readers will no doubt be interested to know that BBC Radio 3's Choral Evensong programme broadcast Second Vespers for the Feast of St Andrew today from the London Oratory. This programme will remain available for you to listen to until December 11th. This small watercolour is kept in one of the rooms of the canon’s sacristy of Todi cathedral, and is an ex voto for the restored health of Msgr. Luzzi (Bishop of Todi from 1882–1888); as a small printed label relates: Al SS. Cuore di Gesù in ringraziamento della guarigione di S.E.R.ma Monsignor Luzzi vescovo di Todi il giorno 5 Maggio 1883. The small painting is interesting as it shows what communion was like in the late 19th century and up to the first quarter of the 20th century. Shown in the painting is a typical “Comunione generale di devozione” which generally took place outside the rite of the Mass, after Forty Hour devotions or a Triduum. The rite is taking place within Todi cathedral and in front of a temporary altar erected for the feast of the Madonna del Campione, a much loved and venerated image of the Blessed Virgin, so called because it stood in a small oratory in the portico of the medieval city hall, where was kept the public sample, or Campione, of the weights and measures in use in Todi. On the 24th of July, 1796, during the anti-Christian persecutions of the French Jacobins, the Madonna was seen by the population to miraculously open, close and move her eyes for several days. Since then, every year in May the image of the Madonna del Campione is taken in procession from its chapel under the municipal palace to the Cathedral where it stays until the 25th of July, thus encompassing also the feast of the Sacred Heart. For this occasion a “macchina,” or temporary altar, with the venerated image of the Madonna is erected in the nave of the cathedral. There are several interesting things to note within the painting. In the first place, there is the fact that communion is evidently a particularly important and exceptional rite. Communion as practiced today is essentially due to St. Pius X’s encouragement of frequent communion but before then, communion was sparingly given and almost all faithful communicated only at Easter (the “precetto Pasquale”) and perhaps one or two times a year. In the late 18th century frequent communion meant once a month. Msgr. Barbier de Montault’s Année liturgique à Rome (1862 and 1870) lists the few Roman churches where general communion was distributed, showing that generally communion was not included in ordinary Masses. In fact, very often communion, especially at Easter, was not part of the Mass: the faithful would go to confession in Lent or Easter and a priest distributing communion would be placed immediately next to the confessional so that penitents passed directly from confession to communion without time to sin! Generally speaking, in the past one would go often to confession and rarely to communion, whereas now it is the opposite. All this contributed to the reverence, sacrality, and exceptional importance of holy communion. As the altar of the Madonna del Campione was a temporary one, there is no balustrade, but a kneeler covered with red cloth or velvet and with cushions; ladies (it is traditionally thought that the ladies represented are actual portraits of some of the most pious of the local noblewomen), widows clad in black, and women of the people, are kneeling or approaching to receive communion. This is solemnly distributed by Bishop Luzzi, who is wearing a gold chasuble and his pectoral cross, assisted by a chaplain in the very short, 18th century Roman style surplices, holding the paten, and by the canons of the cathedral in violet mozzette, short rochets and black cassocks; one is holding the ombrellino as the communion is taking place outside the sanctuary and therefore the canons accompanied the bishop to the altar of the Sacrament to take the pyx with the Blessed Sacrament back to the temporary altar of the Madonna del Campione. Another minister kneels nearby and six altar boys in Roman surplices kneel on the side next to the two Gentiluomini (Gentlemen) of the bishop’s court in black ferraiolos draped around the waist and formal black dress (probably tails or a frock coat; this last considered at the same level of formality as white tie), one holding the silver ewer and basin used for the bishop’s lavabo, whereas the other must have been holding the towel; they are not wearing the 17th century “abito di città” as this ceremony was not of the highest formality. The Mass just celebrated must have been a Missa praelatitia of a certain solemnity with the assistance of the canons but without deacon and subdeacon. On the altar can be seen a set of small altar cards, the chalice with purificator, and the veil. The altar has an antependium and apparently only a very short altar cloth edged with lace (but it is probably only the upper cloth); the sides of the altar are covered by a laceless altar cloth. Short altar cloths that did not cover the sides of the altar entirely were reserved for funerals, but often this was disregarded despite the prescriptions of liturgists and repeated decrees of the Sacred Congregation of Rites. As such, short altar cloths edged with higher and higher lace (generally machine lace, often very beautiful) became very common, especially in the 19th century. 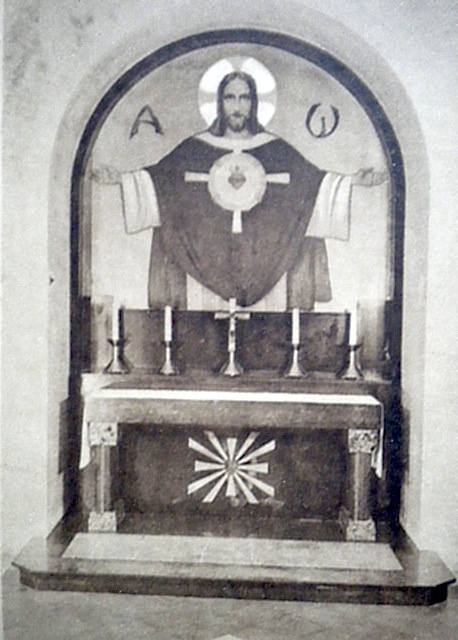 The gradine and tabernacle (open, as it is a bishop’s Mass and the Blessed Sacrament was reserved elsewhere) are evidently designed to support the devotional image of the Sacred Heart. Extra candles are on small sconces as the feast took place during the permanence of the B.V. del Campione in the cathedral. 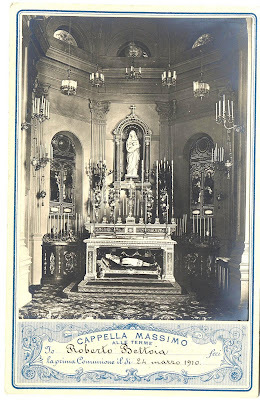 Note the small crucifix on its summit; as the image occupied the place of the cross on the gradine, and as Mass couldn’t be celebrated without one, the legalistic 18th century solution was to place a tiny crucifix wherever possible, on top of altar images, frames, even on the top of altarpieces high up. The six large candlesticks alternate with four “portapalme”, vases or urns made to support “palme,” literally palms, which were bouquets of artificial silk flowers or almond shaped embossed metal bouquets. Collegio Massimo, Rome, chapel, c. 1879. The Collegio Massimo was founded by Fr. Massimiliano Massimo S.J., a member of a princely Roman family, and was the aristocratic boy’s school in Rome. 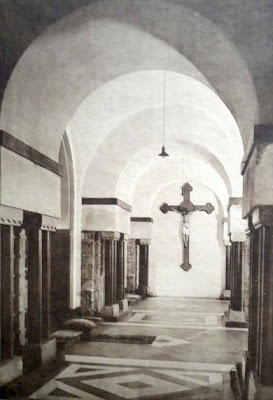 The chapel is typical of elegant private chapels in Rome and shows portapalme in the context for which they were meant. 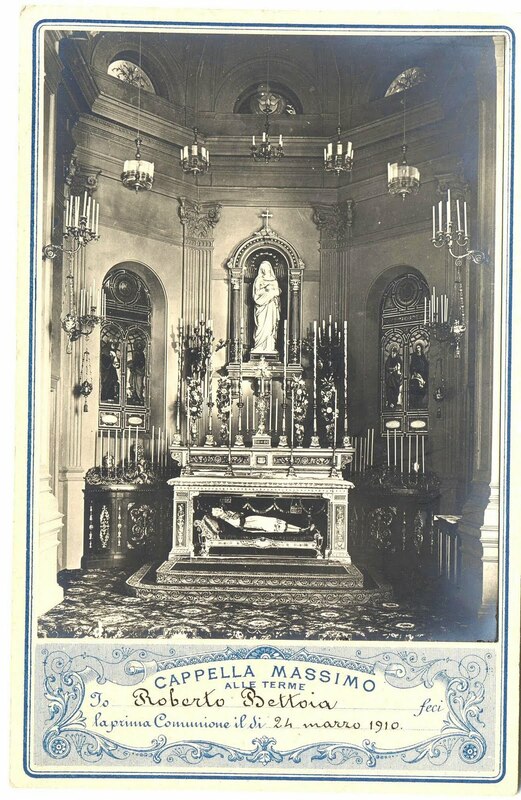 Note the very tall portapalme of silk flowers with satin ribbons of the stem, the reliquary set on a small urn also containing relics in front of the crucifix. There is no tabernacle as the Sacrament would have not been reserved there. The large amount of sconces for candles, the torchères and the chandeliers are meant for Benediction, which would have taken place there. The altar contains the intact body of a martyr, which was a must for prestigious private chapels, and very probably named St. Massimo after the school. The actual relics would have been enclosed in a small coffer inside the representation of the body, with wax head and limbs. The small lamps at the foot of the urn would have been kept burning in his honour. It is likely that normally the urn with the martyr would have been covered by an antependium. The luxurious carpeting is of the sort that would have been used in drawing rooms of a 19th century style that has become traditional for church carpets for ceremonies. Note also the fitted carpet with the rich border on the steps. This chapel, which is in a typically Roman late classicist style, no longer exists as the Collegio Massimo has relocated and the building is actually the Roman museum. These embossed metal palms are extremely stylized representations of bouquets of flowers which were arranged in a very symmetrical composition. This kind of palma, or even imitations of sprays of flowers, were also often made in silver and in silver filigree, but these are extremely rare after the French invasion and sacking of Italy. Readers of this site might be familiar with these last as they are often in use at Ss. Trinità dei Pellegrini in Rome. 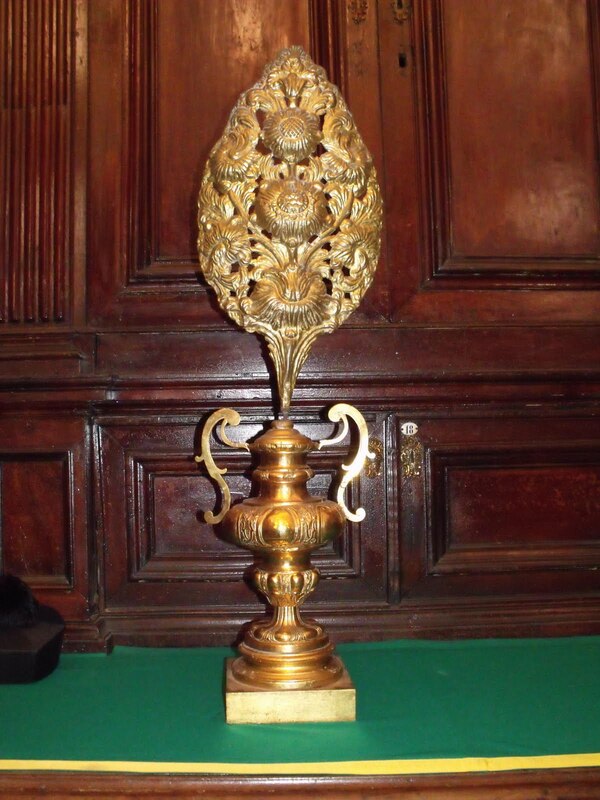 Sometimes portapalme were fashioned in gilt wood, and also gilt and decorated in black and gold for funerals. Palme were even fashioned to hold relics at the center of the flowers. Fresh flowers were generally considered not in the best of taste, in part because decaying flowers were a well known emblem of mortality and vanity, whereas artificial flowers carried an idea of eternity and Paradise. But it must be said that fresh flowers were often used also. Sicilian Capuchins were specialized in the production in palms made with silk flowers, besides candlesticks and other liturgical objects made in straw, which were to be used during Lent, as a exercise in patience. 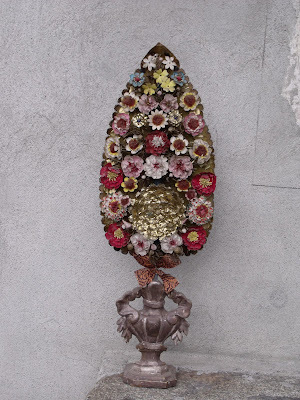 Nuns were also specialized in the production of these delicate and elegant objects. Real palms are used on Palm Sunday, and palms and flowers were removed from the altars during Advent and Lent. 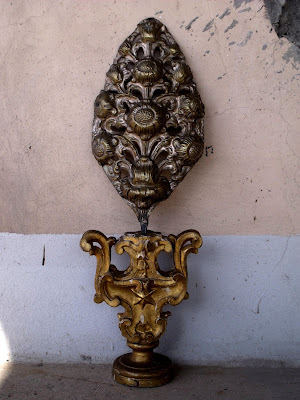 Portapalma, gilt wood, 1820's; palma, painted tole, late XIX c. This kind of metal palm, that could be very large, copied the more expensive but perishable silk flowers. 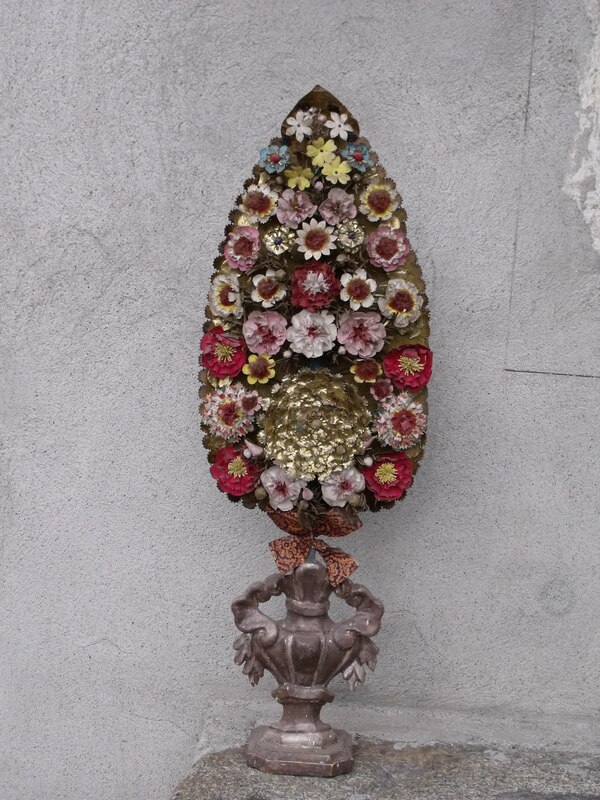 By the mid 19th century very tall bouquets of artificial flowers crafted in painted metal or tiny Murano glass beads were fashionable (I have been told that these last could also be in the different liturgical colours), but the more common type was like the one shown in our painting, highly stylized, almond shaped bouquets -- the almond shape edged with silver or gold lace/silk, with silk flowers and leaves disposed in a regular pattern within the almond, interspersed with gold and silver filigree, lace and decoration. Coloured and gilt paper were also frequently used in these productions. Due to their perishability, almost none of these have survived. This is the type of palma on the altar, and also on the side altar in the background -- which, by the way, also has a throne for benediction. Behind the altar rises the imposing wooden architectural structure supporting the image of the B.V. del Campione, consisting of a large classical pedestal with classical decorations and six candles on gilt sconces. The image is surrounded by draperies, no doubt descending from a royal crown. An architectural exedra or apse with green damask panels, terminating with Corinthian pillars supporting an entablature, encircles the pedestal. All this was part of the temporary structure built each May for the feast of the Madonna. 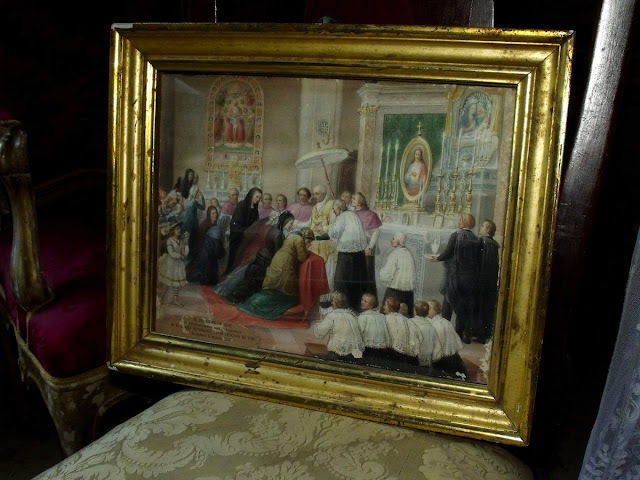 This small painting shows the reverence, liturgical pomp, and solemnity that accompanied the distribution of the Blessed Sacrament by a bishop in his own cathedral, and also many other traditional usages and details which have now almost universally disappeared. My thanks to Don Alessandro Fortunati Celembrini of the clergy of Todi for showing me the painting described in this paper, and for the information on the feast do the Madonna del Campione, I thank the Rev. Don Roberto Collarini, Provost of Varallo, and the Prior (churchwarden) of Crosa, Mr. Roberto Chiocca for allowing me to study the palms of the Oratory of Crosa. My special thanks to Gregory DiPippo for his valuable comments and information. This was the much awaited reply given by Bishop Bernard Fellay of the Society of Saint Pius X, to Vatican authorities. 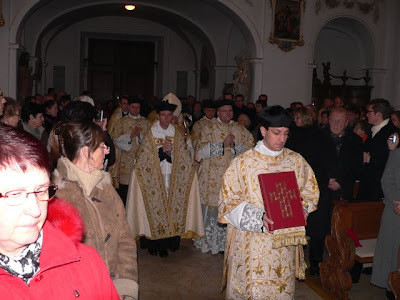 Last September, following a series of doctrinal talks between Lefebvrians and the Holy See, the Congregation for the Doctrine of the Faith delivered the doctrinal preamble text to the Lefebvrians. The Vatican made it clear that it considered their agreement to the points made in the document, vital, if they were to enter into full communion again with the Catholic Church. This would also make it possible for the Church to offer them some canonical status. 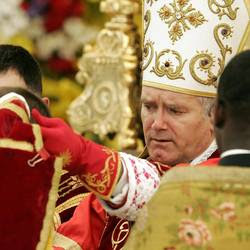 The interview published by Fellay in the Society’s official online bulletin (www.laportelatine.org) reveals that attached to the Preamble, was a note, explaining that Lefebvrians could ask for clarifications in order to suggest any modifications. However, the heads of the Pontifical Commission Ecclesia Dei, the Prefect of the Doctrine of the Faith, Cardinal William Levada and Mgr. Guido Pozzo, are of the opinion that no substantial changes can be made to the document. In actual fact, in the Preamble, the Society was asked to sign the “Professio fidei”, a requirement for anyone who assumes an ecclesiastical office. Three steps of assent are required for the profession of the Catholic faith which distinguishes between revealed truths, dogmatic declarations and ordinary Church teaching. In terms of the latter, the Church states that Catholics are called to guarantee “religious respect of intellect and will” for the teachings that the Pope and the college of bishops “put forward when they exercise their authentic teaching,” even if these are not proclaimed in a dogmatic way, as is the case with most of the Magisterium’s documents. The Holy See has not therefore excluded the possibility of keeping discussions open on certain points of the Second Vatican Council which the Lefebvrians still consider problematic. The path towards a potential agreement with the Brotherhood still seems to be all uphill and there have been rumours over the past few weeks of a strong internal opposition to the Vatican proposal. The Lefebvrian bishop stated that the only eternal doctrine is the Creed, the profession of the Catholic faith, while “the Second Vatican Council” was a pastoral council “which did not define dogmas and did not add any new articles of faith such as “I believe in religious freedom, in ecumenism, in collegiality…” Today, is the Creed no longer sufficient for being recognised as Catholics? Does it not convey the Catholic faith in its entirety?” The bishop seemed to say that the Creed and not the Preamble, which contains the “Professio fidei”, is the common text that the Brotherhood would be prepared to subscribe its name to. It is obvious that the interview did not provide the final response. The Superior of the Society of Saint Pius X is well aware of the internal oppositions with regard to the agreement with Rome, particularly among Lefebvrian leaders. In the written text that will be sent to the Vatican authorities, it appears he will be asking for substantial changes to the Doctrinal Preamble: the fact that the current text “was not met with approval” within the Society, clearly shows that it was not just the commas or the nuances that cause disagreement, but essential aspects of the document. The game is therefore not over yet, and the ball is now in the Vatican’s court as the Lefebvrians await a response to their reply. I am delighted to announce that, thanks to the work of my Dominican Brother Corwin Low, O.P., of our Western Dominican Province House of Studies, Dominican Liturgy Publications can now make available paperback copies of The Dominican Altar Boys’ Manual. This booklet was first published in 1945, and has been in the public domain since 1964. Those interested in a copy may order here. 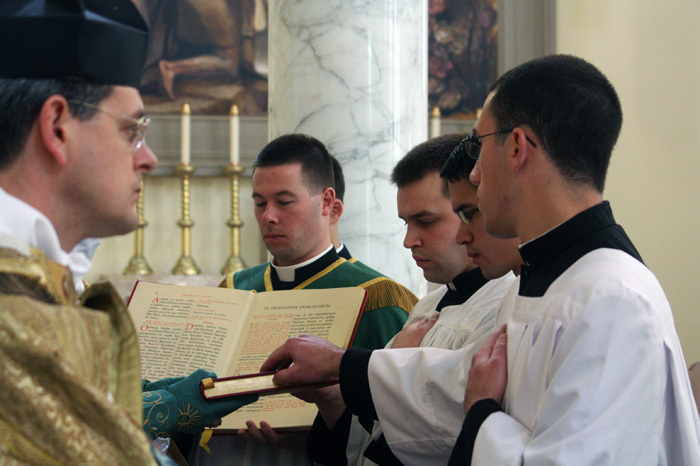 This booklet contains all that is necessary for training young men to serve the simple (Low Mass) and sung (Missa Cantata and Solemn) forms of the traditional Dominican Rite Mass. There are also many other pointers and aids for servers generally. I am sure that many of our readers who are not training servers for Dominican Rite Masses will also be interested in the wealth of information on the Rite available in this booklet. I also ask our readers to offer a prayer for Brother Raymond Bertheaux, O.P., professed as lay (cooperator) brother for 56 years, with decades of service in the missions and nine years at the Dominican Curia in Rome, who will be buried tomorrow in our Province Cemetery in Benicia CA. He was one of the most exacting teachers for me when learning to celebrate the traditional Dominican Rite Mass and was my server many, many times. R.I.P. With the basic structure in place - what can you do so long as the language of the liturgy is not right? - the question arises concerning the next step. What is stage two of the reform? The music issue is most certainly next on the list. Aside from the text, this is the issue that deals most substantially with the core of what we experience at liturgy. 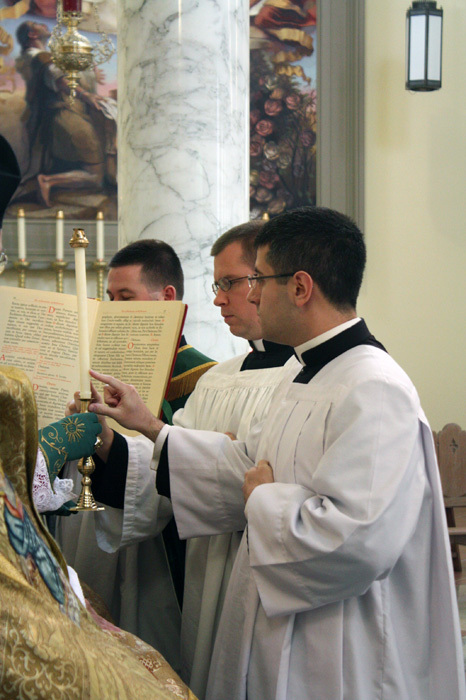 The core question is whether the music at liturgy is there to provide popular entertainment and inspiration or whether it is there to honor God by giving a beautiful and solemn voice to the liturgical texts themselves. The Vatican seems to be alert to this issue. 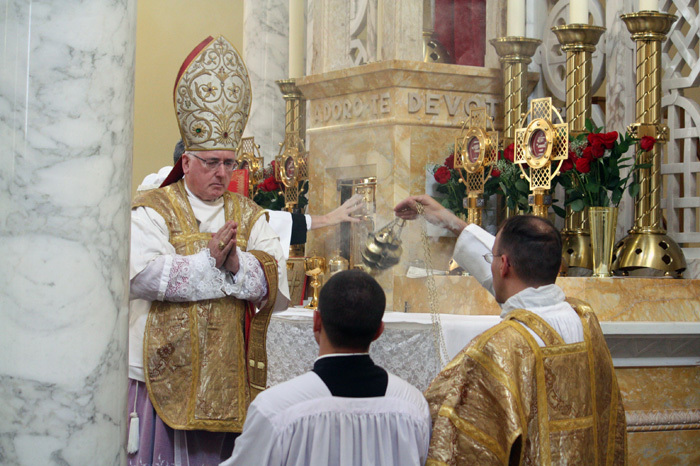 Early in the fall of 2011, Pope Benedict issued a motu proprio that reorganized the Congregation for Divine Worship. To what end, no one knew for sure. Now it has been reported that the Congregation will establish a new "Liturgical Art and Sacred Music Commission” that will begin to take up the music question. Adam Bartlett has linked the two events and speculated that this was the reason for the shakeup, to finally do something about the problem that everyone knows exists but few have the willingness to confront in any kind of legislative way. We can hope for much more than the usual generalized declarations that Gregorian chant should have first place at Mass, that not all music is appropriate at Mass, and that the style of music should be an extension and development of the chant genre. Those points are excellent ones, to be sure, but they have been made again and again for decades, even centuries, but nothing really changes. They are on the verge of becoming platitudes, slogans without real operative meaning. There are several reasons for this: they are too vague and subject to interpretation, people do not really know what it means to give chant pride of place, and it is impossible to develop and extend something you do not know anything about in the first place. What the commission really needs to take on is the issue of the Mass texts themselves. Can we freely dispense with them and replace them with texts of our own composition and choosing? Or must we defer to the liturgy as we have received it and ennoble that liturgy with music appropriate to the task? This is the real question. To put the matter plainly, the Vatican needs to rewrite its own legislation as regards music. It must make the propers of the Mass the mandatory sung text. Mandatory. No exceptions. It must absolutely forbid them to be replaced by something else. This change in the legislation alone would do far more than yet another cautious statement about the lasting value of the Church’s treasury of sacred music. That’s true enough but here is the major difference. 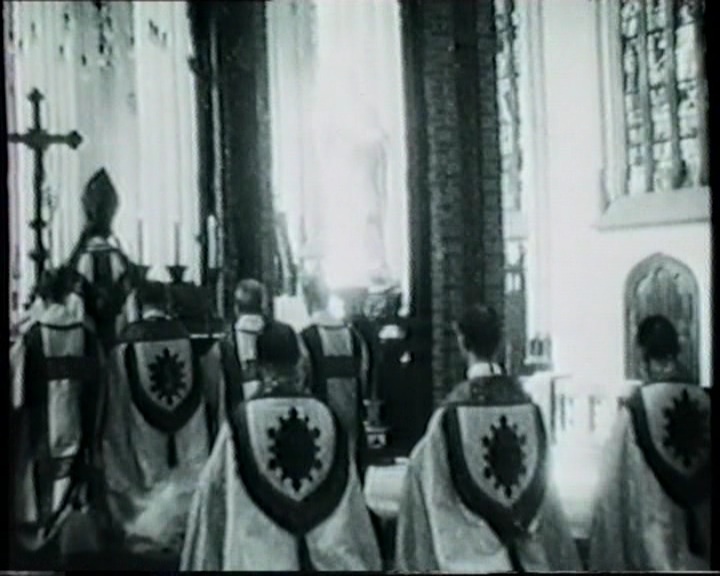 When the people were singing hymns in preconciliar times, the celebrant was saying the propers of the Mass. He said the entrance antiphon, the communion proper, and so on. They were not neglected completely; they were part of the Mass but at low Mass, they were restricted to the priest alone. 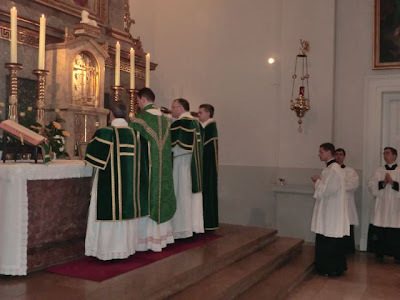 There can be no question that a major ambition of the liturgical reform was to do something about the problem that the low Mass had become the primary form of the Mass that nearly all Catholics experienced week to week. 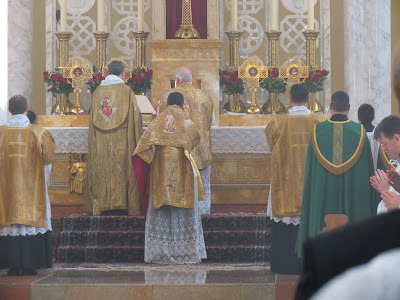 The goal - and this comes through in the writings of the liturgical movement dating back to the early part of the 20th century - was to raise the bar and make every Mass a sung Mass. The Mass was no longer to be the private preserve of the celebrant but rather those prayers and those propers were to be publicly shared and made part of the audible experience of the Mass for everyone..
For this reason, it really was a catastrophic concession that the propers of the Mass can be replaced by the other songs that we alone decide are appropriate substitutes. The concession was made as an afterthought, the option four that was thrown in to deal with the unusual contingency, but it proved to be a moral hazard of the worst sort. It quickly became the norm, and suddenly we found ourselves in an even worse position than we were before the Council convened. Not only were the propers not sung, they were not said either. They completely dropped out of the picture. Many people have pointed out that the new edition of the flagship hymnal of the GIA, called Worship, contains for the first time an index item that draws attention to the entrance antiphon for Mass. People have sent this to me and said it represents progress. I suppose it does. But consider the irony. A mainstream book of some 1000 pages that purports to offer music for the Mass has a few inches in the way back that actually addresses the sung proper of the Mass - and this is cause for celebration? It’s incredible to think that this is what it has come down to. If you want to see a vision of the future, take a look at Jeffrey Ostrowski’s Vatican II Hymnal. Here we have one book that is all about music and all about the liturgy, a book in which the two are not separate but a united whole. The propers of the Mass are there in English and Latin, along with the readings and plenty of music for the whole of Mass. It also provides some traditional hymnody but clearly as supplemental material designed to enhance our experience at a Catholic people and give us additional music with which to praise God. The balance is correct here. The title itself sums up the point: this is much closer to what the Council fathers envisioned. 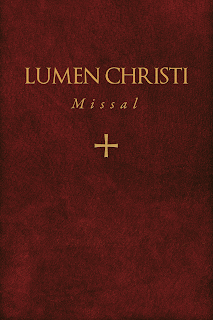 I’ve not previously mentioned another visionary project by Adam Bartlett, the Lumen Christi Missal. What I appreciate most about this book is the clarity of vision, which comes through in the stunningly beautiful typesetting. As I looked at the first draft, I thought: this is so advanced, so effervescent, so solid. I stammered a bit at realizing what I was seeing here. 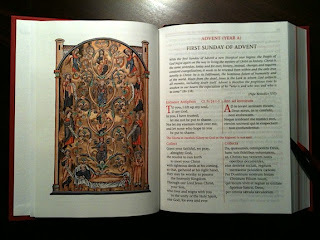 It offers a serious challenge to the way we think of the sung liturgical structure. It gives us readings, the text of the antiphons of the Graduale Romanum and Roman Missal, musical settings of the Mass ordinary, Psalms (including weekday Psalms), plus weekly antiphons from the Missal and seasonal antiphons (primarily from the Graduale Romanum, but also from the Missal and Graduale Simplex) for entrance, offertory, and communion. These antiphons are through-composed with the idea that the assembly can participate in singing them if the propers are not sung in their fullness by the schola. There are no occasional hymns; 100% of this book is drawn from the liturgical text. In some way, I would say that Adam’s book is really the first music book that takes seriously the ordinary form of Mass in English as a ritual of the Catholic faith with a voice all its own, and it is a voice that it is serious, substantial, and special. 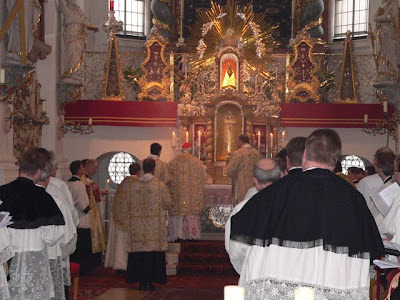 There is not a hint of nostalgia in this work (not that nostalgia is always bad); rather, we see here a settling down of a uniquely conciliar vision for how the liturgy is to be conducted in light of both tradition and the need for development. How many parishes will be bold and (dare I say) progressive enough to embrace this project? Already, there are many people who have signed up to receive notification when the project is complete. Perhaps it will end up in 2% or 5% of the best parishes. Fine. That’s a great beginning. I predict that this could be the beginning of something wonderful in our future. In any case, these are two of many such projects underway. They are in in their infancy, and it will be some time before we begin to see them used more broadly. They all point the way forward. Gregorian chant, yes, but with a practical and realizable strategy going forward. These books move us beyond slogans toward real practice. As the Vatican commission fires up its work toward a musical reform, these books need to be widely circulated as models for how to tackle stage two of the reform of the reform. 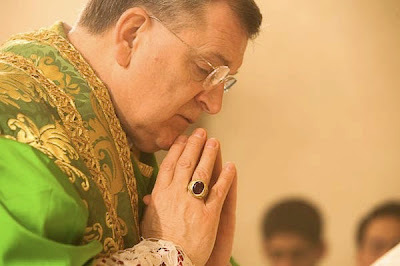 Yesterday, the National Catholic Register ran an article on Raymond Cardinal Burke, Cardinal Burke Talks About Rome, the Mass, Canon Law and U.S. Culture. Of course, all of this is going to raise a natural (and necessary) point of discussion (and no doubt debate): how indeed might mutual enrichment be manifest? What might that entail? These surely are now central questions for the new liturgical movement as it seeks to recover and revive the genuine gains and goods of the 20th century Liturgical Movement, but now set within the present context of two forms of the Roman liturgy and sitting now 50 years out from the Second Vatican Council. As part of this, pertinent and earnest questions surely need to be asked; questions which will consider both those things which (to put a spin on Chesterton) have been tried and found wanting and those which have simply been found difficult and left untried; open and honest questions about the positives and the negatives, the successes and the failures, what was lacking and what is now lacked -- and I speak here of both the pre and post conciliar periods. 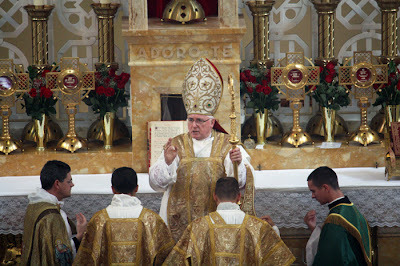 In so doing, we must seek to avoid either a spirit of novelty or the spirit of immobilism, regaining once again a healthy admiration for and respect of our tradition; one excised of any reductionisms, rooted in a deep reverence of our liturgical history and grounded on sound Catholic liturgical theology. The NPR reporter did a fine job in putting together two balanced stories on the new Missal translation. I had two conversations with her, with a total of more than one hour of phone time. What she chose to quote was up to her of course. I'm not unhappy. For the past week and a half or so, I've been meaning to find an opportunity to share the following photos, which will give us some more views of the FSSP's splendid new chapel in their North American seminary, but also a view into something we do not show here too often: the conferral of the minor orders. 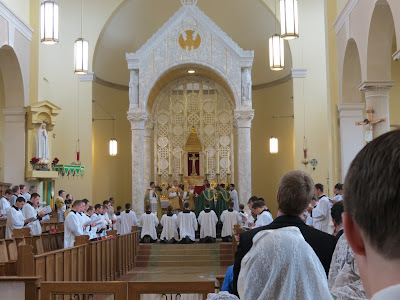 Some time back, I was invited to travel to Our Lady of Guadalupe Seminary (OLGS) outside Lincoln, Nebraska to officiate at the conferral of minor orders for seminarians of the Priestly Fraternity of St. Peter (FSSP). Having had good relations with the FSSP priests at Ottawa's St. Clement Parish... I was open to the suggestion even though I had only rarely celebrated in the Extraordinary Form (EO), which follows the Missal of John XXIII of 1962, that I had known in my early formation from having served Mass. So we fixed on the second weekend in November and agreed that the staff and seminarians of OLGS would assist me in coping with the liturgical requirements of a Pontifical High Mass. ... During my stay I learned that Ottawa was the first diocese in the world to entrust a parish to the care of the Fraternity! Yesterday was a very big day within the English speaking world, for it saw the full implementation of the corrected English translation of the Missale Romanum of the Ordinary Form. I have heard a number of things so far. In some parts of Canada, that exuberance was admittedly tempered by the fact that with the implementation of this new translation of the Roman Missal have come some decisions in some dioceses (it is not universal) regarding matters of gesture and posture at communion time which have met with no little controversy -- the most controversial of which being the move to set the standard posture for the faithful as standing until the very last person has received communion (the more usual custom being that people would return to their pew and kneel in prayer). There has even been a Facebook page started around this: Canadian Catholics preserving the custom of kneeling after Holy Communion. Aside from the matter of altering a fairly strong and established custom, what seems to be a particular irritant here is that some of these places are apparently trying to impose this very rigidly -- i.e. suggesting they may not do otherwise. 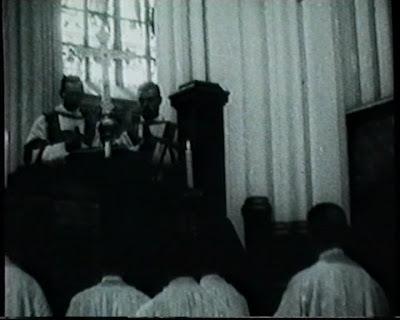 The NLM inbox has seen more than its fair share of questions around this and while it is tempting to do a post on this topic, suffice it to point to this dubium on the posture of the faithful following communion which was made about this precise matter; this makes the mind of the Missal, and Rome, very clear. At any rate, this weekend was evidently a very big deal for a great number of our readers here, be they priests or be they laity. And while obviously this revised translation is only one step in the bigger picture of the "reform of the reform," its importance as a part of this within the English speaking world should not be underestimated. Accordingly, we want to hear your thoughts on this new translation now that it has finally it the altars. Please respond both in the comments, and in our poll. Here is the moment for which we've waited 40 years. The new translation makes its first appearance in live use in the United States. Here is one suggested way to sing the propers (Kindle edition). There are many others. The campaign to save Augustus Welby Pugin's personal church of St Augustine's Ramsgate, was launched at the House of Lords on Monday evening. 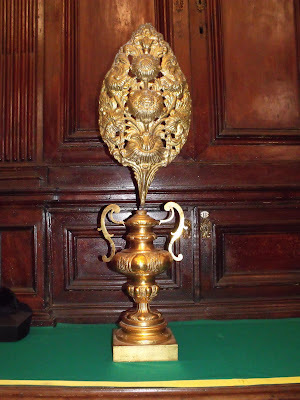 Baroness D'Souza, the Lord Speaker, who invited the Friends of St Augustine to speak of their project of rescuing the church, welcomed guests and emphasised the direct link between Pugin, who is buried at St Augustine's, and the New Palaces of Westminster which he had largely designed from Ramsgate. The Friends hope that the church, which was in danger of being closed down, can be saved in 2012, the bicentenary year of Pugin's birth. Many MPs, heritage experts and ecclesiastical dignitaries, including Archbishop Peter Smith and Bishop John Hine, were present at the launch. Alastair Stewart of ITV news spoke of his personal love of the church with many reminiscences and urged people to get behind the restoration project. “We cannot overestimate the importance of this church. If Pugin is one the greatest ecclesiastical architects of modern English history, and St Augustine's is his personal ideal church, then this site is of vast importance. It is significant at so many levels: spiritually it's the monument of St Augustine's landing, historically it's a centre piece of the 19th century Catholic revival, architecturally it's Pugin's masterpiece and artistically it's full of his best. I'm delighted that St Augustine's is now being recognised for what it is and preserved for future generations. It has been extremely encouraging to see how people both locally and nationally, from different backgrounds and with a variety of expertise, have come together in this project. We have turned a corner in the path of rescuing the church but there is a long way to go and much help is needed”. Here is a gospel book cover. 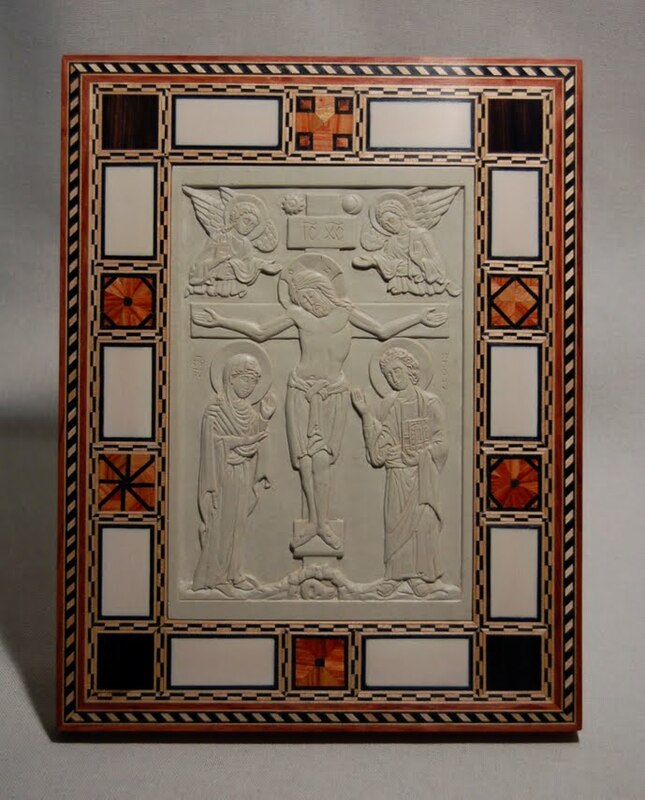 The relief carving in the central portion is by Jonathan Pageau a Canadian based in Quebec and the striking veneer frame is made by Andrew Gould who is based in South Carolina. 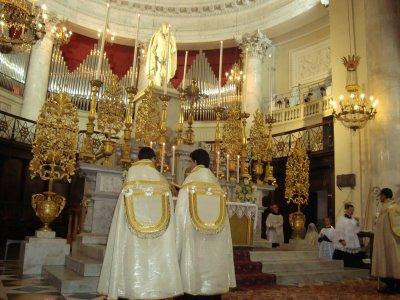 Both are part of a group of liturgical artistans who call themselves New World Byzantine Studios. For the icon painters amongst you, they make gessoed icon boards with raised borders as well. "My design for the gospel cover has two sources. In the 12th-13th centuries, it was common for the western church to set an old Byzantine ivory icon in a gold frame as a gospel cover. Orthodox gospel covers are usually a little different. They either consist of one large icon covering the whole cover, or five small icons (evangelist around the crucifixion). The former is impractical for stone, and the latter too expensive. So I decided to go with the western style in order to accommodate one of Jonathan's carvings. The back cover bears a second icon, with the resurrection. In Orthodox practice, the gospel is placed on the altar with the back cover facing up during Paschatide, so this icon must be on the back. The marquetry frame around the icons is a style that was very typical in Greek Orthodox art in the 17th century. There is still plenty of furniture on Mt Athos and other old Greek Monasteries that is covered with this sort of inlay. It is really an Islamic style of woodwork, still current on Moroccan and Egyptian imports. I find it highly flattering to relief icons, and it reads very well in the dim light of Orthodox churches, so I advocate reviving this sort of ornamentation for Orthdox liturgical use. I used marquetry inlay banding (which is available for musical instrument makers) and salvaged ivory from pipe organ keys. There is no specific explanation for the pattern itself, except that I wanted it to convey the power and significance of the events depicted." Leonardo da Vinci (1452-1519) was the greatest artist and thinker of the Renaissance. Like many eminent painters, he had a mixed start in life. The illegitimate son of a Florentine notary, he was enrolled in the fraternity of St Luke in Florence and was a pupil of the sculptor and painter, Andrea del Verrocchio. Verrocchio’s workshop was the largest in Florence during the second half of the fifteenth century and many Renaissance artists were trained there. The universality of his talent foreshadowed that of Leonardo. Leonardo worked in Florence until 1482 when, at the age of thirty, he was invited to go to Milan by Ludovico Sforza, known as the Moor because he was dark and violent, primarily as a musician, a player on the lyre. In a document urging his continued stay in Milan, Leonardo wrote mainly of himself as an ‘artificer of instruments of war’. From then on schemes of applied science, flying machines, fortifications, waterways, were to occupy much of his energy, while his notebooks were filled with studies of flowers, birds, skeletons, cloud and water effects, children in the womb. He searched insatiably for knowledge, and in the vast medley of his manuscripts he seemed constantly on the verge of discoveries, some achieved, some not yet realised. He never formulated his results or attempted any coherent systematization; when he put theories into practice, whether methods of painting or diversion of rivers, the results were generally faulty. It was the quest which absorbed him: the limitations of human knowledge rather than the potentialities were his interest. It is only in painting, even more in drawing, that Leonardo’s restless, acute intellect expressed itself in an accessible form, and it is as the artist rather than the scientist that he exists today. In Milan, in the seventeen years’ sojourn between 1482 and 1499, in addition to portraits his three great works were the Virgin of the Rocks, the Sforza Monument and the Last Supper in the refectory of St Maria delle Grazie, the supreme image of the subject. Only seventeen of his pictures survive, of which nine are on show at what is probably the most prestigious exhibition ever mounted at the National Gallery. Paintings from as far afield as Milan, Cracow, St Petersburg, the Louvre and the Vatican are assembled with works from the Royal Collection and the Gallery itself. A copy by Leonardo Giampietrino of the Last Supper is on view in the Sunley Room upstairs. Most arresting at the beginning of the exhibition is the portrait of the fifteen-year-old Cecilia Gallerani, Sforza’s mistress, the Lady with the Ermine, famed for her faultless beauty. This painting has a skill in modelling that alone would ensure its repute were not all technical accomplishments, such as the painting of soft light, fur and textiles, subordinate to the completeness of the character study. The still, close-lipped face, half-determined, half-foreboding, is preserved by the hand of genius for posterity. It is in contrast to the later Mona Lisa in the Louvre with its exploitation of the device of the enigmatic half-smile which seems strange and soiled in comparison with the composure of this portrait. The exquisitely-painted ermine cradled in her arms represents Sforza himself, the order of the ermine being part of his heraldic devices. The exhibition’s main gallery is devoted to the dramatic contrast of the two versions of the Virgin of the Rocks, the earlier from the Louvre, the later from the National Gallery. These are hung not side by side but facing each other at the extremities of the room, one heavily fortified in a glass case, the other hung freely. They are united here for the first time and the comparison is instructive. The Louvre version is covered with darkened varnish; the second, commissioned in 1483 and worked on at intervals up to 1508, is thoroughly cleaned and was recently put into a fine contemporary frame. The exact relationship between them is a complex one about which much has been argued, and the difference in their condition makes comparison all the harder. The Louvre version has, despite its strange cave setting, a gentleness that is now lacking from the cold, livid colouring of the London example where, almost certainly, a pupil’s hand was employed. The excellent catalogue regards these paintings as representing the divine and emphasises their command of Marian theology. Both depict the Virgin kneeling in a rocky grotto above the infant Christ, St John the Baptist and an angel, an attitude that represents her as a tender mother immaculately conceived. But perhaps through familiarity, the London version has the edge on the Louvre’s, because the refinement of detail, tonal harmonies and the working of the brush can be seen more clearly. The last picture is the newly-attributed Salvator Mundi. Here we see the hand raised in blessing and the thick, coiling hair which are such familiar ingredients of Leonardo’s mystery, augmented by the rock crystal orb emblematic of divinity. No other painter would have attempted this. I don’t have the space to comment on the many beautiful drawings which complement the pictures, nor the distraction of so many works by Leonardo’s pupils which only serve to show how decisive his influence was in preventing a personal style. The religious images that he created have had a deeper impact than other artists of the time, except perhaps for his great contemporaries, Michelangelo and Raphael. This unique assembly of darkly atmospheric masterpieces will, I suspect, never be repeated. We are certainly entering into concert season, and the following concert which will be taking place in Toronto this December particularly caught my attention. I'd certainly encourage our Toronto area readers to give consideration to attending it. 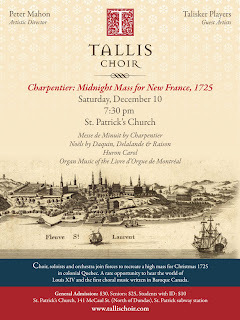 Could the Jesuits have brought Charpentier’s incomparable Messe de Minuit with them on their voyage across the North Atlantic? 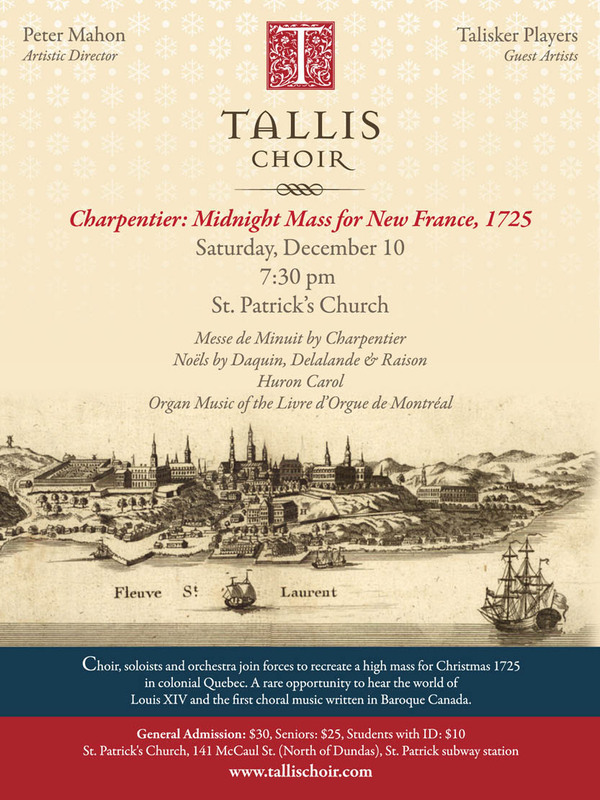 On December 10, the Tallis Choir of Toronto will mount a concert reconstruction of a grande-messe as it may have been celebrated on December 24, 1725 in the capital city of Québec. The Choir has offered similar recreations in past seasons with the music of Gabrieli, Tallis and Victoria. Placing the music in its original sequence gives students of both music and the liturgy a unique glimpse back to the Baroque church. Perhaps the most fascinating feature is the “decadent” Gallican chant which was superseded by the Solesmes editions in 1903. French musicians continued to compose chant well into the 17th century: Henri Dumont and André Campra wrote both orchestral motets and plainsong. The style is surprising. Chant was sung in tempos which varied with the rank of the feast: Christmas was solemn, measure and slow. And the singers added agréments, the vocal ornaments more familiar from the operas of Lully! In 1979, a musicologist discovered a 500-page 17th century collection of previously unknown organ music in a Montreal library. All of it is liturgical and designed to be sung alternatim in alternation with plainsong. A superb overture-style movement will become the “Deo gratias” of the mass. The alternatim pattern is discovered to underlie Charpentier’s Messe de Minuit as well. In the nine-fold Kyrie, the first petition is “sung” by the orchestra, the second by the choir, and the third by the organ. Charpentier’s mass was part of the Jesuits’ program of enculturation. Popular carols became the musical material for the mass. The Jesuits in New France also experimented with using Indian vernaculars in the liturgy. There are many reports of entire masses being sung in aboriginal languages (the fathers of course said the Latin texts privately at the altar.) The concert recreation will include several motets which were sung in both Latin and the Abenaki language. And the concert spiritual before mass will include the famous Huron Carol of St. Jean de Brébeuf, sung in its original form as a French noel with Indian text. A rare opportunity to hear the splendor of the French church in the reign of the Sun King, Louis XIV. As we prepare for Advent in the Roman rite beginning this Sunday, it is worth noting that while there is no "Advent" proper within the Byzantine rite, they do have a period of 40 days preparation for the Feast of the Nativity which is known as the "Phillip's fast" -- so called because it begins the day after St. Philip's day according to the Byzantine liturgical calendar, November 15th. 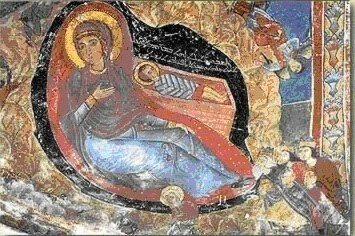 The following article is one which we shared back in 2006, and comes from byzcath.org. The pre-Nativity fast is often called "Phillip's Fast" because it begins on the day after the feast of St. Phillip. The fast was introduced to prepare the Church for a worthy celebration of the great and holy day of the Birth of Christ. The regulations for the fast were far more lenient than the Great Fast before Pascha. Only Monday, Wednesday, and Friday were days of strict fasting without meat, dairy products or oil (in Slavic countries). On Sundays fish was permitted. Lay people were at first permitted to eat fish on other days, too, until the monastic rigoristic influence prevailed. It is interesting to observe that the famous 12th century Byzantine canonist Balsamon expressed the opinion that it would be enough if the lay people fasted only one week before Christmas. In 1958 a modern Greek author, Christos M. Enislides, welcomes Balsamon's suggestion and believes that the best solution would be for the Church at large to abstain from meat and dairy products for 33 days. During the last seven days of the fast everybody should observe the strict fast. 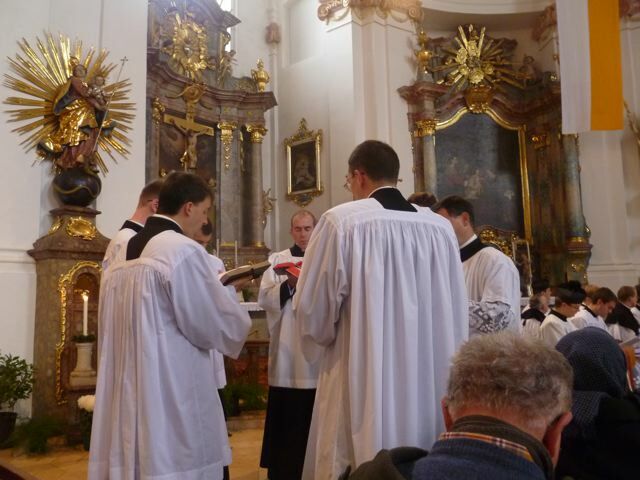 On Saturday, November 19th, H. E. Walter Cardinal Brandmüller ordained Fr. 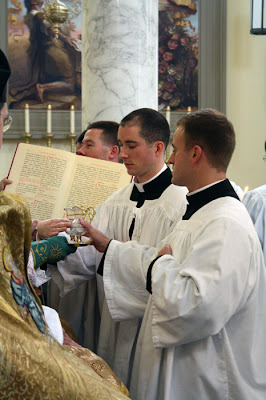 Christian Jäger, FSSP to the sacred priesthood. 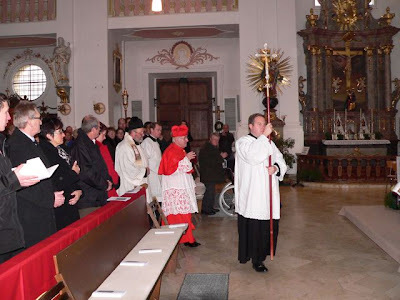 It was for this reason that His Eminence, who is bound up with the Priestly Fraternity of St. Peter since its very foundation in 1988, visited the small Bavarian village of Bettbrunn in the diocese of Regensburg. There the German-speaking district of the Priestly Fraternity of St. Peter runs a house in which some are dedicated to further studies in theology. In fact, Cardinal Brandmüller is from the same town as Fr. 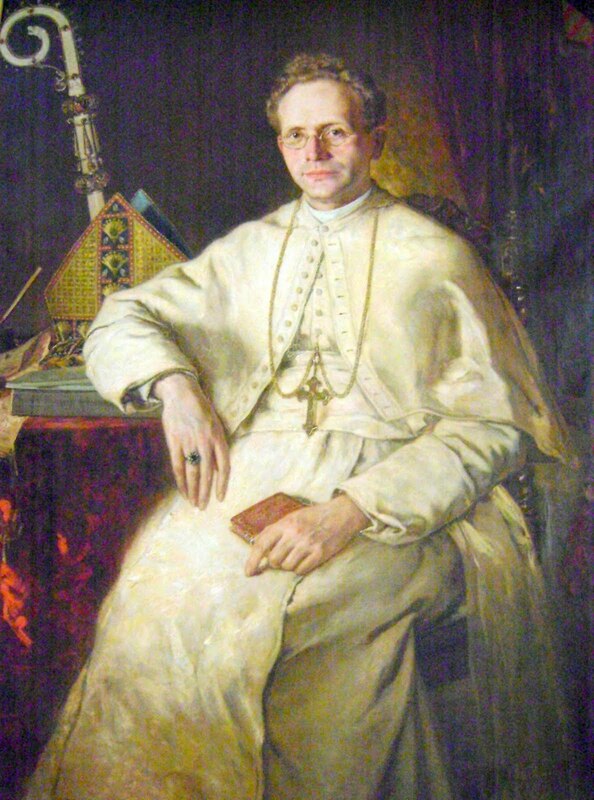 Christian Jäger, FSSP, who was most happy to be ordained by a professor and Cardinal whom he has esteemed for a long time. The Bishop of Regensburg as well as the parish priest generously and warmly agreed that the ordination was held there. The Solemn Pontifical Mass was celebrated in the parish church of Bettbrunn, which was originally a centre of Eucharistic pilgrimage in the 12th century. Today it hosts the shrine and statue dedicated to Our Lord himself as "Salvator mundi," the savior of the world. The Cardinal arrived the day before, so there was enough of time for the consecration of chalices in the private chapel of the Fraternity. His Eminence very patiently attended a rehearsal of ceremonies in the church itself. We all were impressed at how careful he was to observe the sacred rites. In the morning the cardinal was welcomed at the main door of the church by the parish priest and the mayor. He was led to the sacristy, where he was vested. The choir "Sonoritas," friends of the FSSP apostolate in Innsbruck, very beautifully sung Palestrina's Missa Papae Marcelli and the schola cantorum of the FSSP mother house at Wigratzbad sung the Propers of the Mass. According to a German local custom there were additionally hymns for the faithful. Seminarians and clergy of the FSSP served at the altar and about 60 priests attended in choir. In his sermon, Cardinal Brandmüller pointed out that what would happen here is deeply linked to the Last Supper where Our Lord himself told his apostles: "Do this in remembrance of me!" It is a moment filled and enriched by eternity. The Cardinal focused on the priest as teacher, referring to the words of the ordination rite: "Sit doctrina vestra spiritualis medicina populo Dei; sit odor vitae vestrae delectamentum Ecclesiae Christi." Only the bishop, the priest and the deacon is entitled to preach. In our times we have – unfortunately – to be careful because of false prophets and wrong things preached even in sermons, but the faithful can be sure to find true teaching if it is in accordance to the catechism of the Catholic Church or the Youcat. The same evening Fr. 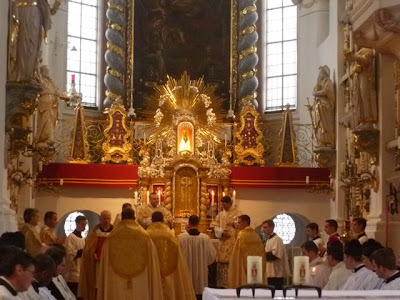 Christian Jäger, FSSP was welcomed by his home parish in Ansbach (Bavaria). The next day he offered his first Mass as a Solemn High Mass. Many clergy attended and the church was crowded with more than 400 faithful. Fr. 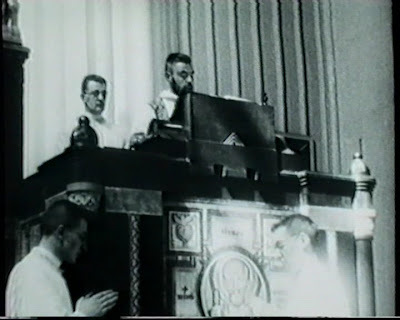 Jäger offered this first Mass at the very same altar where the then freshly ordained Walter Brandmüller himself offered his first Mass in 1953. My post on the revised Preface of the Mass of Thanksgiving Day (USA) prompted Father Mark Daniel Kirby, OSB, of the Monastery of Our Lady of the Cenacle in Tulsa, Oklahoma, to send NLM the text of a homily he preached on Thanksgiving Day in 2005. Rather than using the optional Mass of Thanksgiving Day (the fourth Thursday in November), he celebrated the Votive Mass in Thanksgiving to God. Of course, priests are free simply to ignore the Protestant-originated "feast" altogether in favor of the saint of the day (this year, the optional memorial of St Andrew Dung-Lac and Companions; St John of the Cross in the forma extraordinaria) or perhaps a Requiem Mass (especially fitting for the weekdays in November, the month of All Souls, when the calendar so permits). Dom Kirby's homily deserves a wide audience because of its richly Catholic perspective and its adaptability to one of America's most important holidays. I gladly post it especially for the benefit of homilists who might want to have something both ready-made and of Catholic substance. 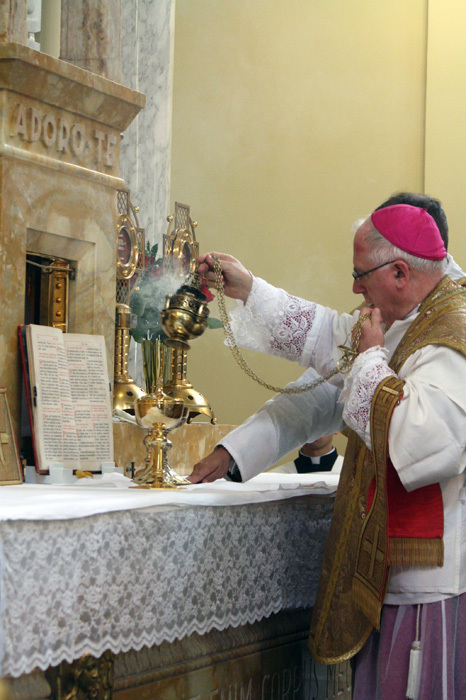 “Solomon stood before the altar of the Lord in the presence of all the assembly of Israel, and spread forth his hands toward heaven” (1 Kgs 8:22); and said, “Blessed be the Lord who has given rest to his people Israel, according to all that he promised; not one word has failed of all his good promise” (1 Kgs 8:56). Solomon standing in prayer before the altar is a figure of Christ, the King of Peace, the Eternal High Priest who, according to the Letter to the Hebrews, “is able to save those who draw near to God through him, since he always lives to make intercession for them” (Heb 7:25). 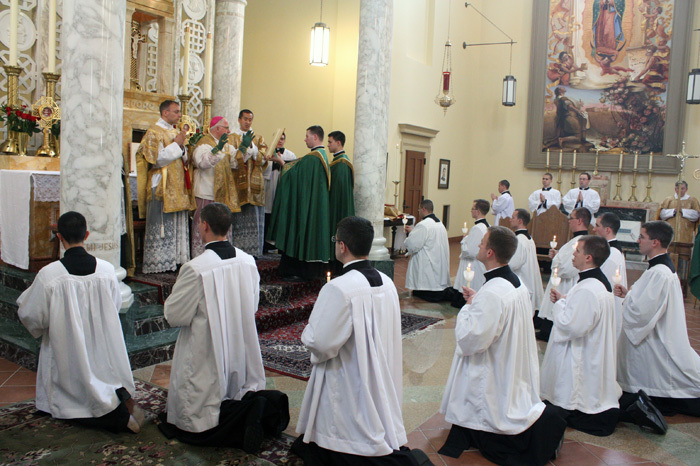 Solomon stands before the altar with his hands spread toward heaven; he is already the image of every priest of the New Covenant who, configured to Christ, adopts that very same posture at the moment of the Great Thanksgiving. The royal priestly prayer of Solomon is brought to perfection in the prayer of Christ; the prayer of Christ is perpetuated and actualized in the Eucharistic action of the Church. “Do this in remembrance of me” (Lk 22:19), he said; and so she does. “Was ever another command so obeyed? For century after century, spreading slowly to every continent and country and among every race on earth, this action has been done, in every conceivable human circumstance, for every conceivable human need from infancy and before it to extreme old age and after it . . . week by week and month by month, on a hundred thousand successive Sundays, faithfully, unfailingly” (Gregory Dix, The Shape of the Eucharist, p. 744). This is the Great Thanksgiving of the Church, one, holy, catholic, and apostolic. This is the Great Thanksgiving of Jerusalem and of Antioch, of Rome, Alexandria, and Constantinople. This is the Great Thanksgiving woven into the history and culture of the Western world. This is the Great Thanksgiving that caused men to raise altars to God and build cathedrals and churches to house them. This is the daily Catholic Thanksgiving, the Thanksgiving offered from the rising of the sun to its setting, the Thanksgiving Sacrifice that the Father himself has given to the Church. It opens with the age-old dialogue: “Let our hearts be lifted high. We hold them before the Lord. Let us give thanks to the Lord our God. It is right and just.” When the priest goes on to sing the exordium of the Eucharistic Prayer, what does he say? “Truly, it is right and just, our duty and our salvation, always and everywhere to give you thanks, Lord, holy Father, almighty and eternal God.” The Mass is our Thanksgiving. The Responsorial Psalm contains the verse that for over a thousand years was part of the daily monastic thanksgiving after meals: “Let all your works give you thanks, O Lord, and let your saints bless you” (Ps 144:10). Living in a Eucharistic context, the refectory is a figure of the church, the common table a figure of the altar, the thanksgiving over the table an echo of the Great Thanksgiving and a preparation for it. The same holds true of the Catholic home. The family is a domestic church, an ecclesiola; the dining room images the church; the table images the altar. The father of the family pronouncing the blessing over the table is an image of the priest. The Eucharist contextualizes all of Catholic life. The Gospel draws us into the Cenacle; it is not merely Thanksgiving Day, the last Thursday of November, it is Holy Thursday. It is the hour of Christ’s Mystical Supper with his disciples. Christ is at table and we are there with him. He speaks to us; he gives us the mysteries of his Body and Blood. He calls us to fruitfulness, to the fruitfulness of sacrificial love. Thanksgiving and fruitfulness are inseparably bound up. Those who are thankful will be fruitful. Those who are fruitful will be thankful. “I chose you,” says Jesus, “and appointed you that you should go and bear fruit and that your fruit should abide” (Jn 15:16). The Mayflower Puritans, you will remember, fled Europe to put far behind them, once and for all, altar and priest, chalice and paten, saints, feast-days, and every Popish trapping and Romish invention. The Puritans of Plymouth and of New Haven deemed the Mass an abomination. They judged even the Protestantized Communion Service of the Church of England by far too Catholic. The Puritans grasped the link between thanksgiving and fruitfulness but, having rejected the Mass, they had no way to express it sacramentally. The Thanksgiving festival emerged in a Eucharistic void, in a culture bereft of altar and of priest. The Puritans of Plymouth and of the New Haven Colony would be horrified to see their “Thanksgiving” observed today in a Papist nunnery with the Romish Sacrifice of the Mass! For our part, being incurably Papist and given to everything Romish, Thanksgiving Day falls within the greater Catholic rhythm of a life measured by thy Holy Sacrifice. We live from Mass to Mass, from one Great Thanksgiving to another. To be Catholic is “always and everywhere to give thanks.” To be Catholic is to live eucharistically, drawn into the prayer of Christ to the Father and the fruitfulness that comes from the Holy Spirit. The Eucharistic life is a ceaseless thanksgiving; it is thanksgiving, semper et ubique, always and everywhere. Saint Benedict teaches us the same thing: to bless always giving primacy to the praise of God, to forswear grumbling and murmuring, so as to enter, day after day, into the thanksgiving of Christ to the Father. We go the altar today, as we did yesterday and as we will tomorrow: to enter into the Great Thanksgiving of Christ our Eternal High Priest. We go to the altar because there is no other way for us to be fruitful, no other way to bear “fruit that will abide” (Jn 15:16). May he take us to himself, and draw us after him, beyond the veil (cf. Heb 6:19), into the presence of the Father. There it is always Thanksgiving; there is made ready for us a feasting that “no eye has seen, nor ear heard, nor the heart of man conceived” (1 Cor 2:9), the wedding feast of the Lamb (cf. Rev 19:9). Today is the feast of St. Clement, one of the earliest popes and the namesake of what is surely one of the most unique and liturgically interesting basilicas in the city of Rome -- which is saying much. Clement, by nationality a Roman, from the district of the Celian Hill, son of Faustinus, occupied the see 9 years, 2 months and 10 days. He was bishop in the time of Galba and Vespasian from the consulship of Tragalus and Italicus (a.d. 68) until the year when Vespasian was consul for the 9th time and Titus was consul with him (a.d. 79). 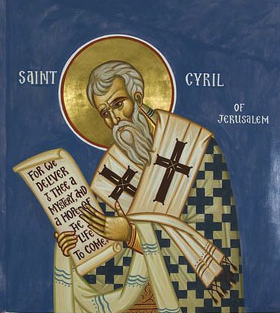 He wrote many books in his zeal for the faith of the Christian religion and was crowned with martyrdom. He created 7 districts and assigned them to faithful notaries of the church that they might make diligent, careful and searching inquiry, each in his own district, regarding the acts of the martyrs. He composed two epistles which are called catholic. 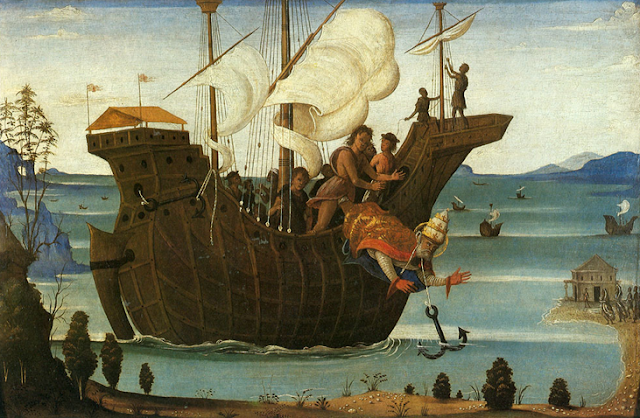 He, by direction of the blessed Peter, undertook the pontifical office of governing the church, even as Peter received the seat of authority from the Lord Jesus Christ; moreover in the epistle which he wrote to James thou mayest learn in what manner the church was entrusted to him by the blessed Peter. Therefore Linus and Cletus are recorded before him for the reason that they were ordained bishops also by the chief of the apostles to perform the priestly ministry. He held two ordinations in the month of December, 10 priests, 2 deacons and 15 bishops in divers places. He died a martyr in the third year of Trajan. He also was buried in Greece, November 24. And the bishopric was empty 21 days. Now Rome venerates thee in prayer before these altars. For this, the honours paid to thee here make amends. Musica Sacra Florida will be holding a conference entitled “Gregorian Chant and Modern Composition for the Catholic Liturgy: Charles Tournemire’s L’Orgue Mystiqueas Guide," to be held February 1-3, 2012 at NOVA Southeastern University in Fort Lauterdale, Florida and the Church of the Epiphany, Miami. More on the event can be found here. On-site registration will not be provided, so make sure to do it in advance! While we have posted about this upcoming event in the past, we have not yet passed on the exciting news that part of the conference will include a Mass in the extraordinary form of the Roman rite celebrated by His Excellency, Thomas G. Wenski, Archbishop of Miami. Musical highlights will Tournemire’s office from L’Orgue Mystique for the day (Purificatio B. Mariæ Virginis), a Missa Brevis by Zachary Wadsworth, and a specially-commissioned motet by Dr. Paul Weber. 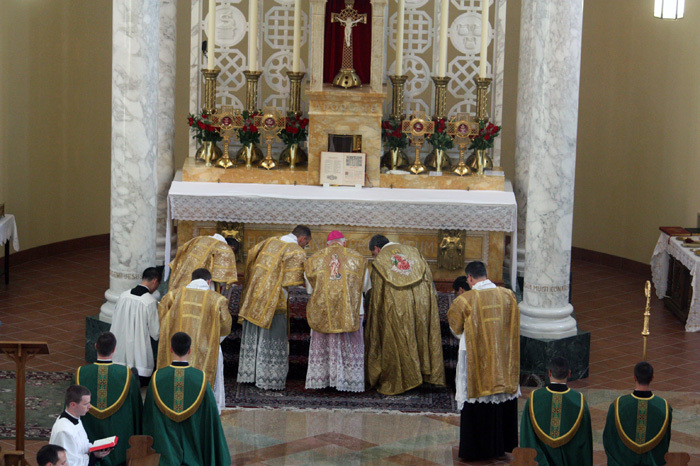 I am unsure when the last solemn pontifical mass was celebrated in Florida by a sitting ordinary; I suspect, as it was quite a long time ago, this is quite a newsworthy event, and one which bodes well for the Church in Florida. Guest article by Frater Anselm J. Gribbin, O.Praem. 1. Removing the two altars at the entrance to the choir, and enlarging the choir by one aisle, which would thus shorten the nave, leaving the High Altar intact. 2. Taking the choir benches across to the transept crossing. 3. Erecting a High Altar in the transept crossing, and removing the altars at the entrance of the choir and the old High Altar, thus allowing space to enlarge the choir. There were also plans to erect more side altars around the choir in neo-gothic chapels, as there were still too few side altars for low masses. A young architect was chosen for this work, Jules Ghobert of Brussels (1884-1971). However ‘neo-gothic’ had fallen out of favour in this period, and ‘art décor’ was the preferred style for the new work. It seems that the abandonment of neo-gothic did not meet with everyone’s approval, at least initially, and it was said, rather mischievously, that Ghobert had lost the neo-gothic plans for the new side chapels on a train ! In any case, as far as the expansion of the choir was concerned, the third plan was the one that was chosen, and it was, for its time, quite radical. Ghobert was the architect responsible for this work, and it included an extensive redesign of the interior of the church, in favour of art décor : though the keen eye will see that other styles were also used. The imposition of art décor in a neo-gothic church can be compared to the introduction of the baroque and rococo styles in many medieval churches. Apart from the removal of the all the neo-gothic altars in the church – except the altar of St. Siardus – and other adaptations, sections of the walls of the nave, and elsewhere, were covered with grey bricks, and the floor level of the choir, and the site of the new, central High Altar, was raised, to incorporate a crypt, where the abbey’s relics were to be kept. 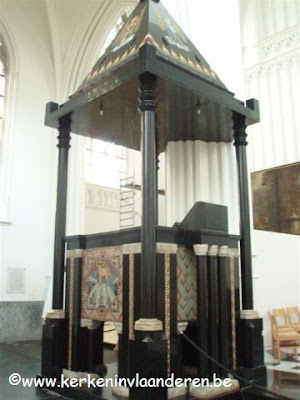 The existing choir benches of greenwood (groenhout), were extended, and an elaborate ‘throne’ (‘prelaatstroon’) was made for the abbot. 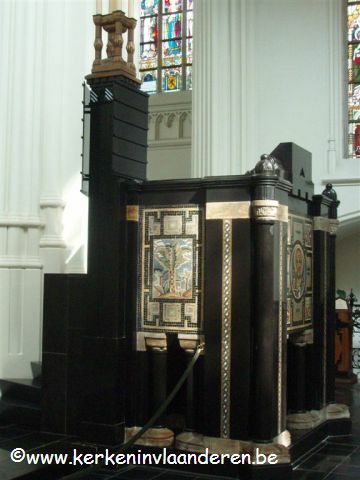 The new choir at Tongerlo, with abbot’s throne and relocated area for cantor and succentor (pre-1929). Note the old organ (top right). 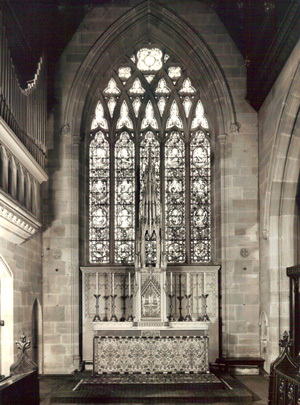 The choir could now seat seventy canons, and the lay brothers were re-located to the side of the new High Altar. Curiously, but perhaps understandable, the abbot’s ‘throne’ was designed in the neo-gothic style, based on a design by Fr. 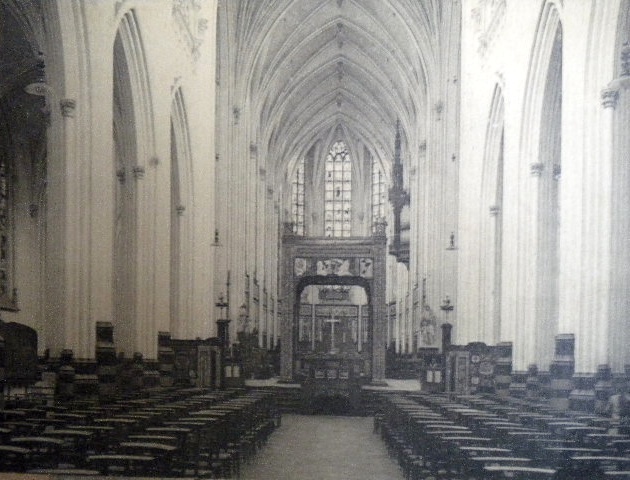 Milo Bertram, and matched the existing neo-gothic confessionals in the nave. The walls of the choir were further decorated, with geometric designs, as were the lower sections of the pillars in the nave. The new, free-standing High Altar, southward facing (in the direction of the nave), stood under a ciborium, made of grey bricks. This was intended as a temporary arrangement : the grey bricks would be easy to dismantle at a later date. The ciborium was decorated with various motifs, painted on paperboard, which were to be eventually replaced by mosaics. Surmounting the corners were various armorial shields, including those of Abbot Lamy and the abbey of Tongerlo. Hanging underneath the ciborium was a beautiful ‘corona’ (chandelier) : a similar example can be still be seen in the church of the sisters of the Sacred Hearts of Jesus and Mary in Antwerp. 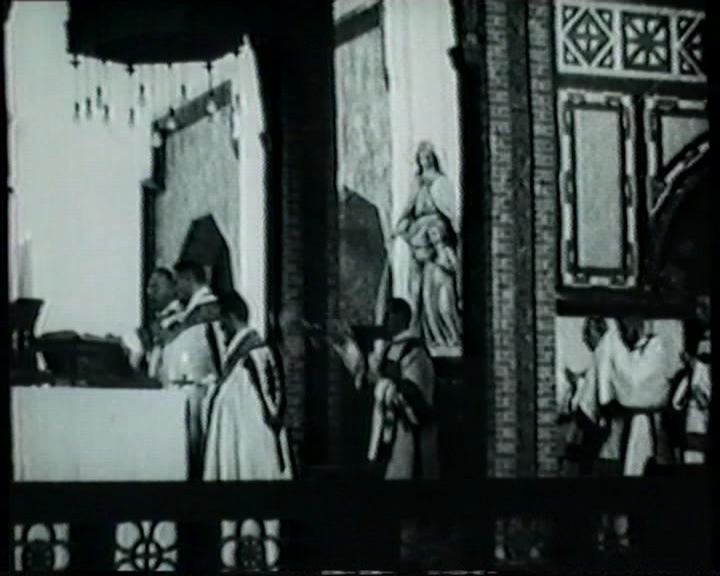 The first Mass was celebrated at the new High Altar – before the new ciborium was in place - at Christmas 1919. The first pontifical Mass, with the new ciborium in place, took place on 15 August 1920. 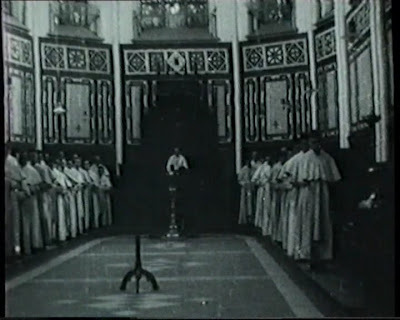 There were also further additions to the church in the same period, two of which were also intended to play a role in the solemn liturgy of the High Altar. Ghobert designed two ambos, in black marble (‘belge noir’) – this material was used elsewhere in the remodelling of the church - one for the reading of the epistle (southward facing), and the other, for the proclamation of the gospel (eastward facing). 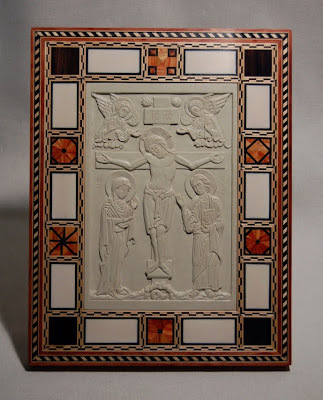 The upper part of the gospel ambo was added by 1935, and both ambos were decorated with mosaics by Charles Counhaye (1884-1971). The gospel ambo was decorated with the Lamb of God, the sower, and the four evangelists, while the epistle ambo was decorated with a bust of St. Paul, symbols representing the four great doctors of the Latin Church (SS. Ambrose, Gregory, Jerome and Augustine). 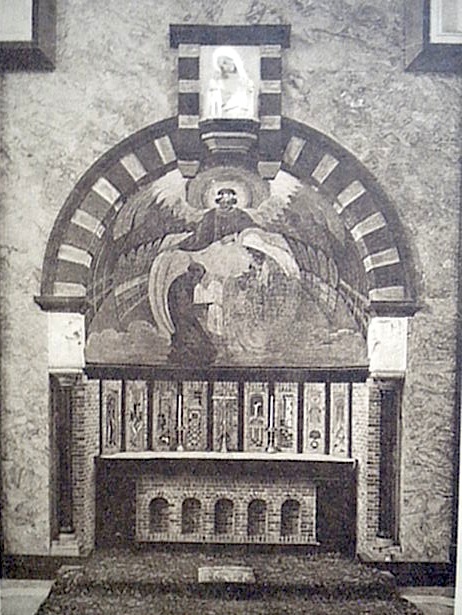 A new Blessed Sacrament chapel (with stained glass by Charles Counhaye), of black marble, was also constructed in the west transept, and also an altar in honour of Our Lady in the east transept. Plans were also made to construct an ambulatorium with side chapels, thirteen in total. However sufficient funds were not forthcoming to complete the ambulatorium. 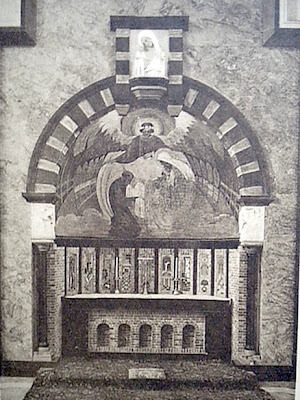 Yet sections of the ambulatorium were realised, with altars in honour of the Sacred Heart, the Holy Family and St. Thérèse of Lisieux (west side) and two altars on the east side. 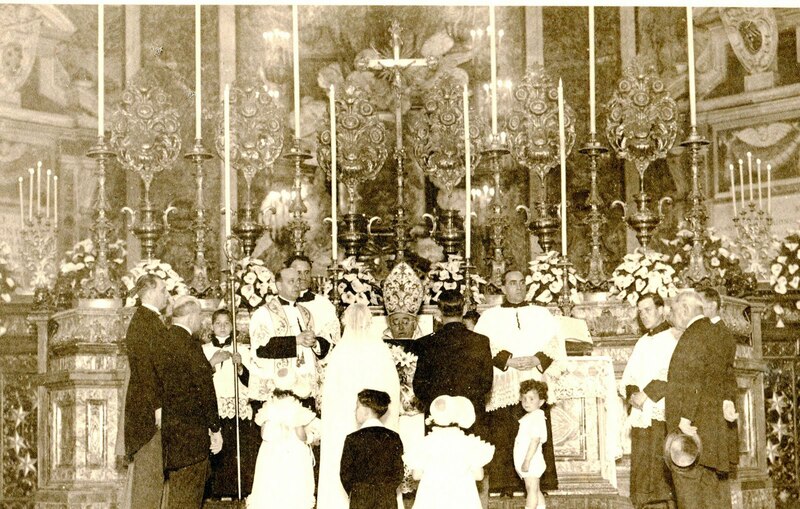 On 1 May 1928 the altar of the Blessed Sacrament was consecrated by Mgr. Micara, the papal nuncio, the altar of the Holy Family by Abbot Lamy, and the altar of St. Thérèse by (titular) Abbot Seadon of Corpus Christi Basilica, Manchester: our abbots have the privilege of consecrating altars. Whoever was present at the divine service in our abbey church at Christmas, would certainly have been deeply moved, more than usual, by the excellence of our Norbertine liturgy. This is more apparent (lit. ‘it has come into its own’) than in former times, now that our church - due to the continual increase of the number of religious - is undergoing a fortunate change, that qualified persons find most agreeable, and that the [new] arrangement comes close to the sanctuary of the early Christians … Before the entrance of the previous choir stands the High Altar, a simple stone table, as it was before the third century … a simple table [‘tafel’] of sacrifice … How solemn, how enthralling, was that [first] Mass sung by our abbot … behind [sic] the altar stood the religious in their temporary choir ; in front [sic] of the altar, in the church [i.e. the nave] kneeled the flocking faithful. Everyone, the canons as well as the multitude in the church, could watch every action of the sacred ceremonies: we prayed with him [i.e. the abbot], we offered with him the divine lamb of atonement to the heavenly Father … It was as if Heaven became opened, before our eyes … “Then I saw standing in the midst of the throne and the four living creatures and the elders, a Lamb that seemed to have been slain. I looked again and heard the voices of many angels who surrounded the throne and the living creatures and the elders. They were countless in number, and they cried out in a loud voice: ‘Worthy is the Lamb that was slain to receive power and riches, wisdom and strength, honour and glory and blessing’” [Apoc. 5 : 6, 11, 12] … the High Altar must still be crowned with … the ciborium … which directs the attention of the visitor … to the altar, and says to him “This is God’s throne”. 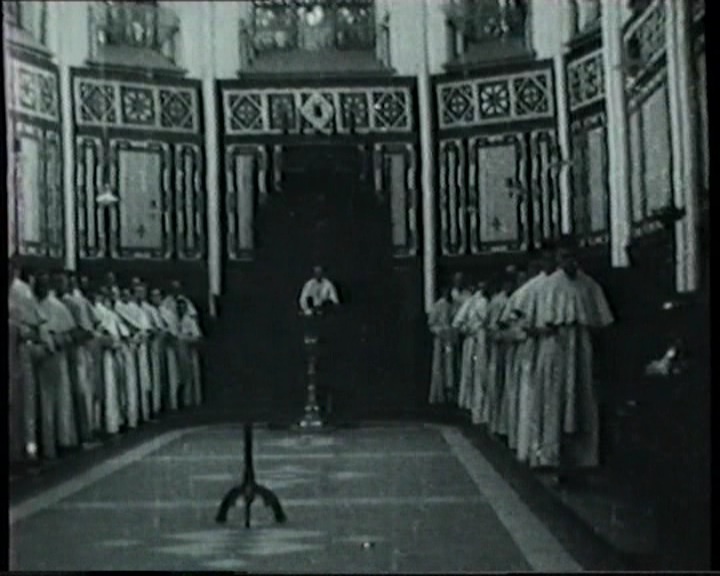 The beauty of the liturgy of the re-designed abbey interior is also evident from an old film apparently made in the 1930’s to raise funds for the rebuilding of the abbey after a devastating fire in 1929: thankfully the interior church was largely spared any damage. 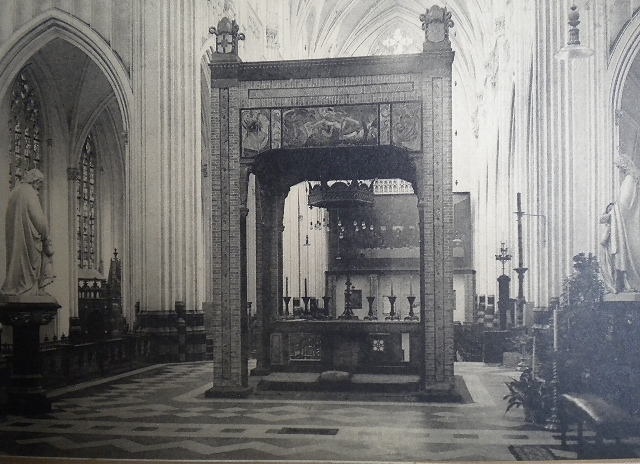 It was after this that the abbey was to obtain a permanent High Altar. 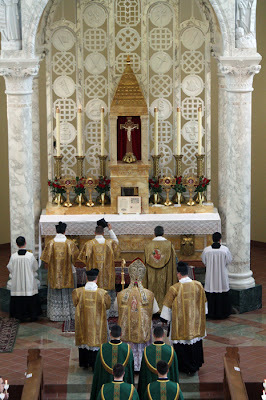 The conclusion of pontifical High Mass at the new High altar : Abbot Lamy, with the sacred ministers and assistants.